Chicken Souvlaki Quinoa – A delicious Mediterranean inspired chicken dish with mouth watering flavors. Served with grilled vegetables, quinoa and brown rice. Grilled Greek Chicken Quinoa Brown Rice Bowls - a Mediterranean inspired weeknight chicken dish full of bright flavors served with grilled vegetables, olives, feta on a bed of quinoa and brown rice. Whisk together marinade in a large bowl then add the cubed chicken and toss to coat. Cover and refrigerate the chicken for 45 minutes to 2 hours. Cook the quinoa according to package directions and as desired. **Heat the grill to medium high heat. Brush the grates with olive oil then place the skewers over top. Grill the chicken for 3-4 minutes per side, gently flipping and cook for another 3-4 minutes, until chicken is cooked through and has light char marks. While the chicken is grilling, toss the zucchini, bell peppers, tomatoes and artichoke hearts onto the grill and cook for about 3-4 minutes on each side, or until tender. Fluff the quinoa brown rice and divide among bowls. 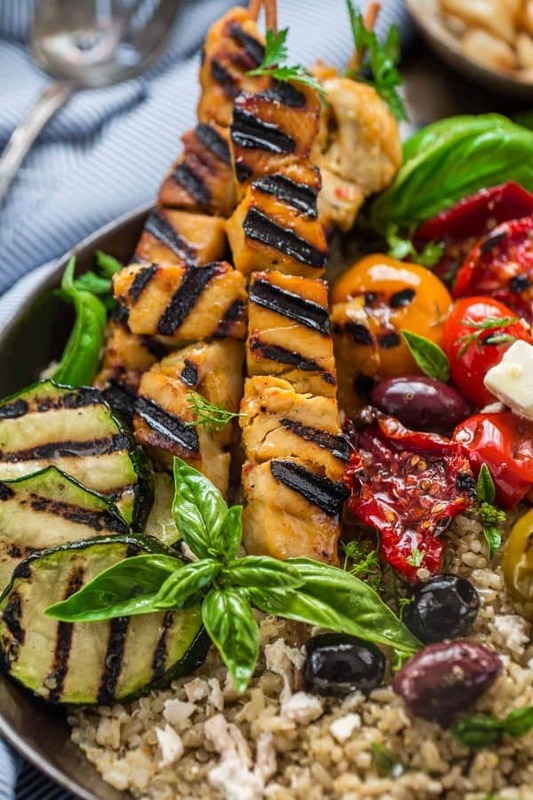 Add grilled vegetables, olives and chicken skewers. Sprinkle with feta cheese and serve with extras as desired. To make the Tzatziki sauce: combine all the ingredients by hand or a blender (if you want it smooth). Cover and refrigerate until ready to use. **If you don't have a grill, you can also use a grill pan to cook everything on the stove.